Editor’s note: This write-up (and the pictures) are from last year. By the time the story was written and edited, the ski season was nearly over so we saved it for this ski season. 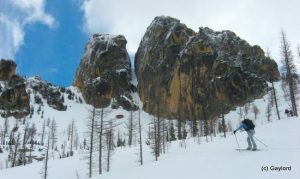 The Birthday Tour is a classic ski tour by Washington Pass that many of our local backcountry skiers try to visit every year or three. 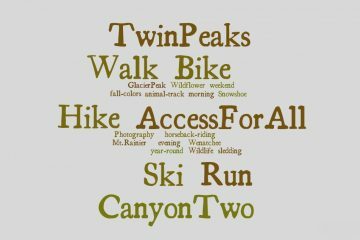 After you’ve done the Washington Pass Birthday Tour, you may also want to tackle the more difficult (physically and navigationally) Chiwaukum Birthday Tourwhich is right in our backyard. You never forget your first birthday party – full of icing, presents, games and friends. Birthdays are a celebration of the past and wishes for the future. They are a transition from one time to another. 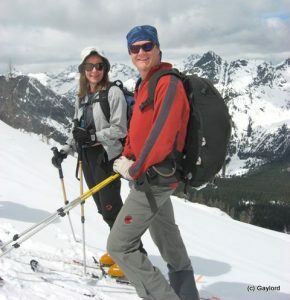 On Saturday, May 22, a small group, Tom and Patti Janisch, Chester Marler, Drew Gaylord, and I celebrated the coming of age of two brand new backcountry skiers on the Birthday Tour at Washington Pass. 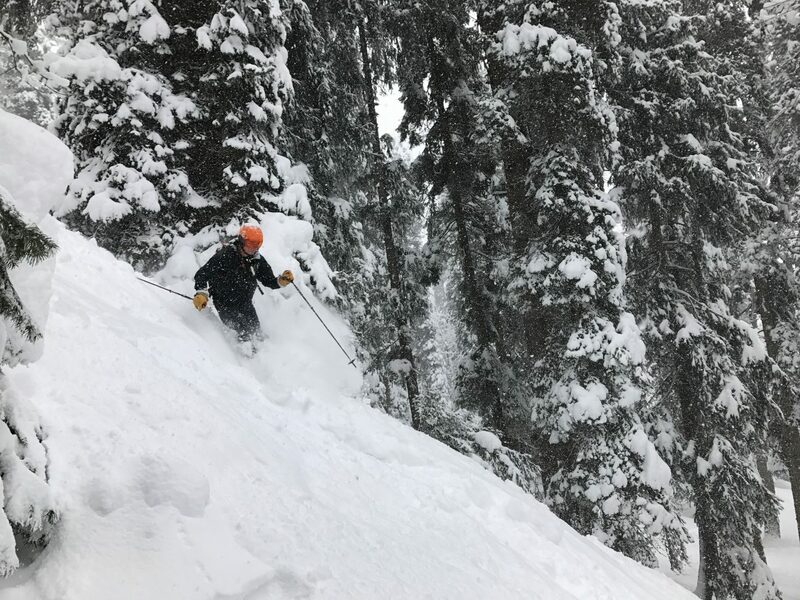 Drew and I, became downhill skiers as adults and almost never ventured out-of-bounds at downhill areas until this year when we joined the WenatcheeOutdoors backcountry ski classes put on with the contributions of many of our local avid backcountry skiers. To start our birthday party, the first present we were given was great weather. Forecasts all week were for scattered snow showers, clouds, and low temperatures. But this birthday party couldn’t be rained out. We received sun, calm winds, and just enough cloud cover to keep the snow from becoming mush. The mountains, and even the trees, were iced with fresh snow from the week’s unsettled weather. 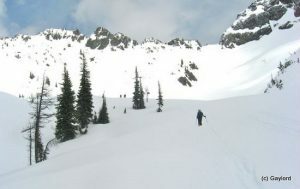 We began our ski tour at the Blue Lake Trailhead on Highway 20. We skied up through of open old-growth forests into alpine meadows, and then to base of the cornice at the saddle of Cornice Peak. If the meadows and slopes are the cake of the Birthday Tour, the cornice is the ice cream. With a perfect hand-scooped swirl it perches precariously, looking both tasty and threatening should it topple. At this point, Drew and I knew we were definitely off-piste. 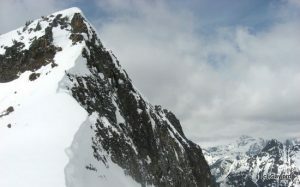 No ski area would ever allow any thing as wonderful and dangerous as that cornice. It’s larger than a semi-tractor but, miraculously, the left side is perfectly shaped to allow you to boot-up and top-out without placing yourself in its path. This was first time Drew and I had ever booted-up such a wild ski slope. Once on top, the party games began. All around us were the decorations; Cutthroat Peak, South Early Winter Spire, Liberty Bell, Silver Star, Stiletto, and many more. Below us 1500 vertical feet of perfect intermediate slopes dropped to the valley floor between the Twisp River and Washington Pass. We skied down these slopes on snow the consistency of sun-softened butter. At the bottom we grinned at each other like kids who had won all the favors. Drew and I looked around. No lift lines, no crowds, no ropes – just mountains, ravens, and friends. At our notch, we plunge-stepped down a short narrow chute – actually, in my case, I backed down the chute, whimpering). We then made a short traverse to the fall-line skiing leading down to the cars. This side of the mountain had deeper, soft snow—it was the whip cream for our birthday treat and it was tasty. Half way down, larches stood like candles. There weren’t enough to catch your hair on fire – just enough to be festive. As we blew by them on our last turns, I made my wish for many more such backcountry tours. 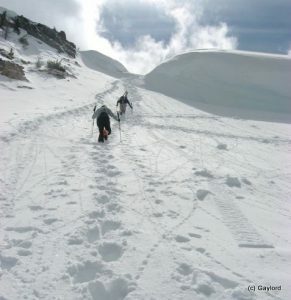 Special thanks to Andy Dappen, Chester Marler, Freeman and Sherrill Keller, Tom and Patti Janisch, Mark Shipman, Dave Allyn, and Shannon Griggs for all contributing to our backcountry-skiing conversion. 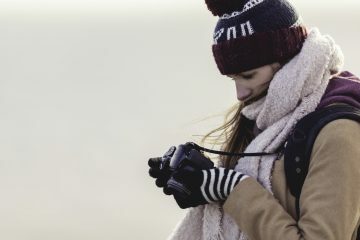 This post was originally published on 3/9/11.